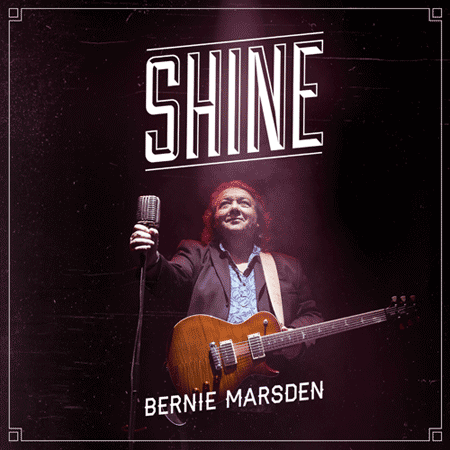 Bernie Marsden’s new solo album called Shine (about which we wrote in November) is ready and will be released on August 18 via Provogue/Mascot Records. Although Marsden was wary of flooding the credits with too many special guests, Shine does feature some extremely well-known names, from Joe Bonamassa to Whitesnake singer David Coverdale and the Deep Purple duo of Ian Paice (drums) and Don Airey (keyboards). If you preorder the album directly from the label, they promise to include a free poster. There’s quite a bit of Ready An’ Willing in there. And you know, we’ve got David singing on it, which is fantastic. You know, and getting him involved was really, really good for me. That felt really… I don’t know, what’s the word? It felt right. To do that track. To say, ‘Mate, do you want to sing on this?’ ‘Yeah, of course.’ So it was great. We didn’t have to ring up managers and stuff in order to do this. It was just two guys talking together. He did it and it was great. And then Joe Bonamassa got involved… well, Joe was involved really from the beginning, and it was through him that I got to meet these people from his record label. I’ve been playing with Joe off and on for about two years, invited out to his gigs and stuff and then finally the guys came out and said, ‘Hey, we’d like you to make an album for us.’ And it was great. And I said, ‘Well, I’ll make an album for you but I want Joe to play on a track’ (laughs). Joe’s great; he’s a really good guy but you know about him anyway. Read the rest of the interview on BraveWords. I thought Here I Go Again was fabulous because for me it was such a long time after I had written the song that I could listen to Whitesnake in that period as if I was listening to Journey or Forgeigner: it was just another band who were really good. But they were an American band by then [who] just happened to have the same name and the same singer and guy I worked with. Fool For Your Lovin, when they re-recorded that I felt it lacked some of the heart and soul of what the song was all about and I know that David has more or less said the same thing in interviews over the years. I think Steve Vai is a wonderful guitar player and he did a very good Steve Vai job on that track, but I didn’t think it had the heart of what the song was all about. So you win some, you lose some. But having said that it sold about three-and-a half, four, five million [copies], so I can’t complain too much! [laughs] It continues to do well to this day. Posted by Nick Soveiko on Monday, May 26th, 2014, filed under News. You can follow comment on this post through the RSS 2.0 feed. You can leave a comment below, or trackback from your own site. Bernie has a new solo album ‘Shine’ released this week, featuring guests, Joe Bonamassa, David Coverdale, Don Airey and Ian Paice.